Divina proportione (Divine proportion), later also called De divina proportione (The divine proportion) is a book on mathematics written by Luca Pacioli and illustrated by Leonardo da Vinci, composed around 1498 in Milan and first printed in 1509. Its subject was mathematical proportions (the title refers to the golden ratio) and their applications to geometry, visual art through perspective, and architecture. The clarity of the written material and Leonardo's excellent diagrams helped the book to achieve an impact beyond mathematical circles, popularizing contemporary geometric concepts and images. The book consists of three separate manuscripts, which Pacioli worked on between 1496 and 1498. He credits Fibonacci as the main source for the mathematics he presents. Its value represents divine simplicity. Its definition invokes three lengths, symbolizing the Holy Trinity. Its irrationality represents God's incomprehensibility. Its self-similarity recalls God's omnipresence and invariability. It also contains a discourse on the regular and semiregular polyhedra, as well as a discussion of the use of geometric perspective by painters such as Piero della Francesca, Melozzo da Forlì and Marco Palmezzano. The second part, Trattato dell'architettura (Treatise on Architecture), discusses the ideas of Vitruvius (from his De architectura) on the application of mathematics to architecture in twenty chapters. The text compares the proportions of the human body to those of artificial structures, with examples from classical Greco-Roman architecture. The third part, Libellus in tres partiales divisus (Book divided into three parts), is mainly an Italian translation of Piero della Francesca's Latin writings On [the] Five Regular Solids ("De quinque corporibus regularibus") and mathematical examples. In 1550 Giorgio Vasari wrote a biography of della Francesca, in which he accused Pacioli of plagiarism and claimed that he stole della Francesca's work on perspective, on arithmetic and on geometry. After these three parts are appended two sections of illustrations, the first showing twenty-three capital letters drawn with a ruler and compass by Pacioli and the second with some sixty illustrations in woodcut after drawings by Leonardo da Vinci. Leonardo drew the illustrations of the regular solids while he lived with and took mathematics lessons from Pacioli. Leonardo's drawings are probably the first illustrations of skeletonic solids which allowed an easy distinction between front and back. Another collaboration between Pacioli and Leonardo existed: Pacioli planned a book of mathematics and proverbs called De Viribus Quantitatis (The powers of numbers) which Leonardo was to illustrate, but Pacioli died before he could publish it. Pacioli produced three manuscripts of the treatise by different scribes. He gave the first copy with a dedication to the Duke of Milan, Ludovico il Moro; this manuscript is now preserved in Switzerland at the Bibliothèque de Genève in Geneva. A second copy was donated to Galeazzo da Sanseverino and now rests at the Biblioteca Ambrosiana in Milan. The third, which has gone missing, was given to Pier Soderini, the Gonfaloniere of Florence. On 1 June 1509 the first printed edition was published in Venice by Paganino Paganini; it has since been reprinted several times. The book was displayed as part of an exhibition in Milan between October 2005 and October 2006 together with the Codex Atlanticus. The "M" logo used by the Metropolitan Museum of Art in New York was adapted from one in Divina proportione. ^ a b c d e O'Connor, J J; Robertson, E F (July 1999). "Luca Pacioli". School of Mathematics and Statistics. University of St Andrews. Retrieved 15 January 2015. ^ Hart, George W. "Luca Pacioli's Polyhedra". Virtual Polyhedra. Retrieved 23 January 2015. ^ Hoechsmann, Klaus Hoechsmann (1 April 2001). "The Rose and the Nautilus". University of British Columbia. Retrieved 15 January 2015. ^ Livio 2003, p. 130. ^ Livio 2003, p. 132. ^ Livio 2003, pp. 130, 131. ^ a b Gardes, Michel (20 June 2001). 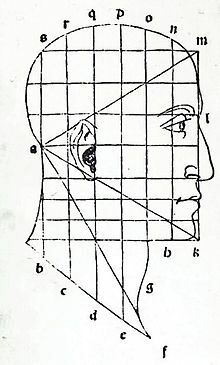 "La Divine Proportion de Luca Pacioli" (in French). Académie de Poitiers. Archived from the original on 27 January 2015. Retrieved 15 January 2015. ^ Field, J F (1997). "Rediscovering the Archimedean polyhedra: Piero della Francesca, Luca Pacioli, Leonardo da Vinci, Albrecht Dürer, Daniele Barbaro, and Johannes Kepler". Arch. Hist. Exact Sci. 50 (3–4): 241–289. ^ "Divina proportione, after Leonardo da Vinci". The Collection Online. Metropolitan Museum of Art, New York. Retrieved 15 January 2015. ^ Livio 2003, p. 137. ^ Nuovo, Angela (2014). "PAGANINI, Paganino". Dizionario Biografico degli Italiani (in Italian). 80. Treccani. Retrieved 27 January 2015. ^ "The Virtual Codex Atlanticus". Leonardo3. Retrieved 15 January 2015. ^ "Renaissance 'M' Bookmark". The Met Store. Metropolitan Museum of Art, New York. Retrieved 15 January 2015. Livio, Mario (2003) . The Golden Ratio: The Story of Phi, the World's Most Astonishing Number (First trade paperback ed.). New York City: Broadway Books. ISBN 978-0-7679-0816-0. This page was last edited on 21 March 2019, at 07:09 (UTC).